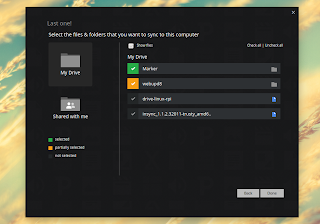 Insync is an unofficial Google Drive client which "extends Drive's web functionality to your desktop by integrating tightly with Windows, Mac and Linux so you can get work done". The app is not free: it costs $15 per Google account (one-time fee) and there are separate plans for 3 Google accounts and for business - see the Insync pricing page for more info. Also, there's a 15 day trial if you want to try Insync before purchasing a license. 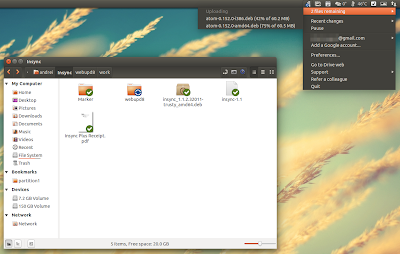 On Linux, Insync comes with notification area (systray) and Ubuntu AppIndicator support. Furthermore, it integrates with most file managers - there are extensions available for Nautilus, Nemo, Caja, Thunar and Dolphin. Insync 1.1 was released about a week ago, bringing various bug fixes and optimizations such as faster initial sync and fixed stuck metadata syncing issues, as well as nested selective sync, a long-awaited feature for many users. Nested selective sync allows you to selectively sync sub-folders and files. Insync 1.1 was also supposed to bring a file compare feature but unfortunately this was delayed for a future release, due to "how complex the file compare technology has proven to be". The Linux downloads page provides packages for Ubuntu / Linux Mint, Debian and Fedora as well as unofficial Arch Linux AUR packages portable binaries. After installing the Insync package, the app will try to detect your desktop environment and offer to install a file manager extension. However, you can install any of the available Insync file manager extensions manually (for Nemo, the extension is called "insync-nemo", for Nautilus: "insync-nautilus" and so on).